Wales "Land of my Fathers"
On the westward side of England, lies the mountainous, valley pierced, wave beaten land of Wales. Although it is small in size it is unequalled in its beauty and charm. Its mountains are higher than any in England, its valleys more beautiful and its coastline more rugged. It is a land older than its larger neighbour England and the mountains of Wales were old when the chalk of England's 'Downs' and Salisbury Plain were an ooze on the ocean bed. 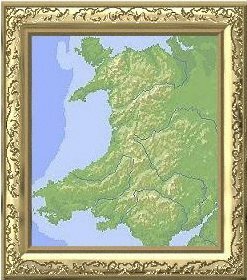 The people of Wales are descendants of the original inhabitants of the British Isles and descendants of the conquering Celts and Gaels. During the Roman conquest of the British Isles, the people of Wales held the might of the Rome at bay for some time and were only conquered after fierce resistance. Its people, later resisted Saxon invaders, the Vikings and Irish raiders. When all England was subject to Norman rule, the inhabitants of Wales remained free for many years. Wales is a land steeped in heritage, folklore and legends such as King Arthur and his knights. Its history fades way back into the distant mists of time.The people of Wales had their own welsh language and were known as the "Cymry", which translated into English means "comrades". The welsh language sadly declined under English rule, but these days is enjoying a long awaited revival in its schools and institutions. The "Cymry" of today still keep their ancient language, cherish their ancient traditions, honour their ancient bards and heroes and Wales is known as a land where every place-name has a meaning, where every hill and valley has its legend. But except Wild Wales they shall lose their land." Is to be born privileged. And poetry in your soul."